The Ford TeamRS is Ford Motor Company's European performance car and motorsport division for Ford Racing activity. The Ford RS badge was born for rally racing, the RS stands for Rallye Sport. TeamRS is the successor to Ford Special Vehicle Engineering. TeamRS has been superseded by a global organisation called Ford Performance. 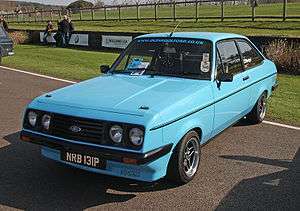 Wikimedia Commons has media related to Ford TeamRS.